The Corporate Housing Providers Association (CHPA) is the professional trade association exclusively dedicated to supporting corporate housing providers around the world. With more than 300 company members, CHPA works closely with related trade associations such as the Worldwide Employee Relocation Council (WERC), National Apartment Association (NAA) and various others as an advocate and educational resource for the corporate housing industry across the globe. CHPA recognizes success and achievement within the corporate housing industry by presenting the highly-coveted Tower of Excellence Awards at its national conference each year. Company award categories include Best Community/Philanthropic Program, Most Creative Marketing, Best Green Progress and the most-coveted, highly-competitive award of "Provider Member/Company of the Year," which is given to companies in two categories (under 300 units managed, and over 300 units managed). 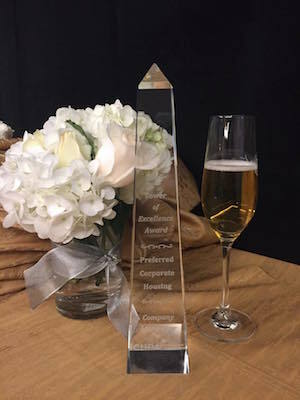 The 2015 Tower of Excellence award for "Provider Member/Company of the Year - Over 300 Units" was presented to the Preferred Corporate Housing team at the awards luncheon last week in Orlando, Florida. "We are extremely proud and honored to win this prestigious award," said Jon Lanclos, Founder and CIO of Preferred Corporate Housing. "Being included in this category with so many other heavy-hitters and industry leaders is a challenge in itself. Coming away with the recognition of 'Company of the Year' really legitimizes the hard work and dedication that our team has put in to being the best corporate housing provider." CHPA selects "Provider Member/Company of the Year" award winners based on scored evaluations from the following categories: a) Contributing locally, nationally, and internationally to the corporate housing industry b) Creating unique solutions or programs to enhance the industry. c) Achieving sound financial results as they pertain to growth through sales and other initiatives. d) Exceeding guests' expectations measured by survey results or testimonials from guests or clients e) Developing strong relationships with other corporate housing providers f) Developing collaborative relationships with supplier partners. "We've really focused on what sets us apart," said Samantha Elliott, President of PCH. "Its not just about providing a furnished apartment. Its about finding opportunities to personalize our service, customize the solutions we offer and really 'wow' our guests each and every time. Every person on our team plays a vital role in making that happen, so we are happy to share this award with them," said Elliott. The "Provider Member/Company of the Year - Under 300 Units" award was presented to Avenida Suites, a Tampa-based provider. Preferred Corporate Housing is proud to share this award category with such a great partner. Preferred Corporate Housing has been providing furnished temporary housing services across North America for more than 20 years. With service to more than 42,000 locations, PCH has become a go-to resource for more than 8,000 local, national and global clients including 413 companies on the 2014 Fortune 500 list.